Place: Chapter One Books, 19 Lever Street (actually on the corner of where Dale Street crosses Lever Street), Manchester M1 1BY. Most importantly, it’s a venue that loves all things ‘booky’ - making it the perfect place for our next MABF. If you’d like to take part (and here at Hot Bed Press we hope you will), tables cost £45 and are available on a first come, first served basis. Please specify your preferred size but note we cannot guarantee you will get the size you request (we will endeavour to book you a table size the nearest to the one you have requested). Sorry but because tables are limited we can't reserve them. Tables will only be a confirmed booking on receipt of full payment and fees are non-refundable. To book, please call 0161 743 3111 - payment can be made over the phone by credit or debit card. Once you’ve booked, we’ll be in touch with some additional logistical information including what promotional activity we’ll be doing to support the event. If you’re new to book arts and would like to learn more, Hot Bed Press might just have the answer. We run The Complete Book Artist – a year-long course in book arts running over 30 weeks; February to June & September to December,tutored by Sylvia Waltering with other respected guest lecturers. We also run weekend and evening courses in book arts, letterpress and printmaking. * (We had 2017 off, having run it since 2010 at MMU, and a guest slot in 2016 as part of Design Manchester's take-over of the old Piccadilly Fire Station). Manchester Artists' Book Fair started way back in 2006. Launched by Manchester School of Art's Neil Grant and the Righton Press. In 2009 Hot Bed Press had so many members with tables at the fair as well as our own Hot bed Pres stand/s Neil asked us whether we would take over the running of the whole event. 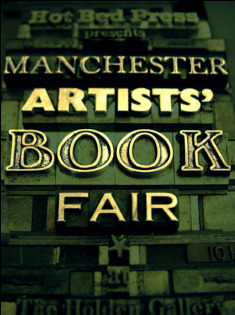 So in 2010 we started running MABF with the 5th Manchester Artists' Book Fair. It was a huge success and we expanded to include artists' talks events, lectures, links with Special Collections and performances. All good things come to an end, and with the expansion and development of MMU and The Holden Gallery the university were unable to offer us the space from 2016. No sooner had we announced the sad news we were approached by Design Manchester to see whether we could run the book fair at a different venue and link with the bigger Design Manchester festival. In 2016 we teamed up with Design Manchester and worked alongside Manchester Print Fair in a one-off event at Piccadilly Fire Station. It was a great event and very well attended. We had to reduce the number of tables to just 20 tables. We had been really fortunate to have the large Holden Gallery at Manchester Metropolitan University, (MMU), School of Art, which was a great setting and able to accommodate 43 tables. In 2017 we had hoped to again work with Design Manchester, but the Design Manchester team could not secure us a venue in time, so we reluctantly had to take a break. 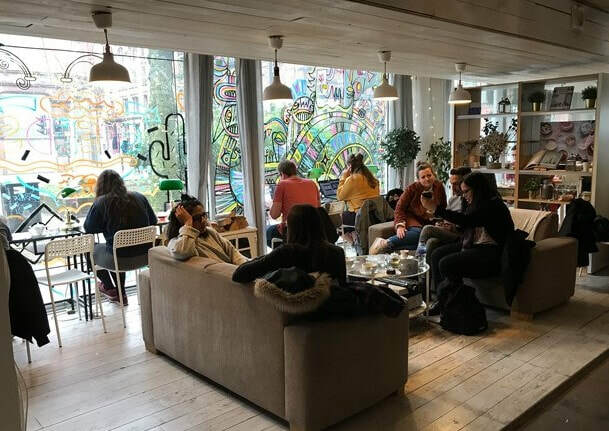 To be honest, with all the work going on at Hot Bed Press with us buying our building, undertaking major works on the building and expanding our facilities we were relieved to have a breather. But for 2018 we are back. We are at Chapter One in The Northern Quarter with space for 20 tables in a vibrant, friendly environment. In case you're wondering what we mean by Artists' Books, they're books made by artists. Well, aren't all hand-made books made by artists? Yes - but consider the possibilities. This is about bookbinding, and printing, and paper... but so much more. It could involve photo-journalism, maps, wooden type, memories, observation, chapbooks, opinions, illustration, letterpress, journals, zines, pamphleteering... or taking existing books and reworking them - check out the photos on this site to see what we mean. Are we stretching the definition of a book past breaking point? Try and stop us.